I was off to a stellar start: yogurt with berries and granola for breakfast, brown rice with stir-fried greens for lunch, and Indian-spiced cauliflower over (more) brown rice for dinner. In the evening my daughter and I experimented with a batch of whole-grain cookies (and actually liked them). I was smug by the end of Day 1. 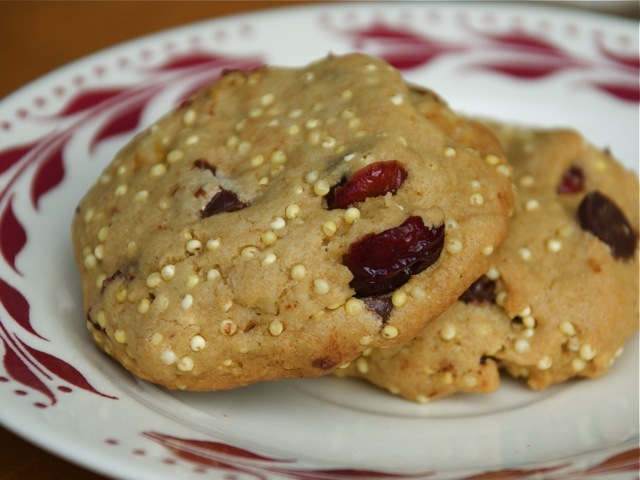 Not exactly adventurous — oats and brown rice — but then again, not everyone stirs a cup of millet into a batch of cookies. I'm feeling good on Day 2, out of the starting blocks making a pot of oatmeal. All morning I feed my brain whole grains — perusing recipes, sifting through resources. For lunch I meet a friend at one of my favorite Thai places. While eating a soul-satisfying bowl of curry noodle soup, I tell her about the Whole-Grain Challenge. She doesn't miss a beat asking me if the noodles we're slurping are made from whole grains. Of course not! There's nary a whole grain on the menu, and if there were I probably would have passed over it in favor of the khao soi kai. I feel a teeny, as in teff-size, pang of remorse, but resolve to make up for my wanton ways at dinner. The evening meal, it turns out, my husband has already started by the time I get home: French toast with bananas and maple syrup. I am so grateful that he initiated dinner I don't have the heart to resist or reproach. It's 7:30, and the not-so-little beasties and I are hungry. And no, it wasn't whole-wheat bread but slices cut from a delicious (and fair as the driven snow) artisan loaf. I finished the meal with a millet cookie and wondered how many more I'd have to eat to meet my daily quota of whole grains — 10? maybe 15? Whole grains at every meal? This is a challenge!